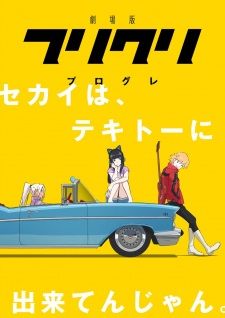 Plot Summary: In the new season of FLCL, many years have passed since Naota and Haruhara Haruko shared their adventure together. Meanwhile, the war between the two entities known as Medical Mechanica and Fraternity rages across the galaxy. Enter Hidomi, a young teenaged girl who believes there is nothing amazing to expect from her average life, until one day when a new teacher named Haruko arrives at her school. Soon enough, Medical Mechanica is attacking her town and Hidomi discovers a secret within her that could save everyone, a secret that only Haruko can unlock. But why did Haruko return to Earth? What happened to her Rickenbacker 4001 she left with Naota? And where did the human-type robot "Canti" go?